Do anyone know if they're freely posted somewhere, or is it more of a private thing between the japanese danmakufu developers? Are there any specific guidelines for them? What is this, my third request? Yeah, i'm looking for a Yukari cutin, but I need it to be one of dairi's versions. Dairi's uploaded all the games except PCB for some reason, so I can't find one. If I could instead have an entire folder of PCB cutins, i'd appreciate it. But all I need right now is a Yukari cutin. If you can't find any, I can try to make some note-shaped danmaku (I need to make them eventually anyway for my own game, so I can just make them now rather than later). I find almost the PCB characters by dairy on his Pixiv (http://www.pixiv.net/member_illust.php?id=4920496&type=all&p=17). Prismriver's Note - Prismriver's double Note - Tsukumo's Note (in 4 frame). I don't test the animation but I this it work well. I make it red but you can easilly change it. I hope it's what you want =). Sorry I'm so late, but real life and all that prevented me from getting the projectiles done sooner. Only single 1/8 notes, with and without circle around them. I know they are incredibly bright (but I like them this way ), so if you want to use them, feel free to change their brightness via some filter in any decent picture editing program. Anyone know of a tree texture/resource that's freely useable? If it's a mesh, then it can be easily rendered. Otherwise, it can be done with 1 or 2 primitives. If there is a white background, then it can be edited out with an image editor. I also found a page linking to free fonts that support Japanese. Most of the listings on the page itself, though, explicitly list permissions only for sites or print works, so it might be useful to visit the links to see how exactly you can use a certain font. The Nico Commons link should be removed. What's the point of a "free assets" thread if the first link out of all things points straight to a site where most content is stolen? You might as well just link to google and tell people to search for "free game sounds". That's not helpful at all. That site's staff have shown 0 interest in keeping that place clean from stolen stuff, so it's a completely unreliable source of freely usable material. Because while it does of stolen assets, it still contains free material. I agree with Bigode here. Removing the link now. Sorry. I don't quite understand this. Do you intend to mean: "It is stolen, but because it is available for free it is free?" or did you meant: "among the stolen work there is actual free to use stuff?" The former is not a valid reason. The latter is more understandable but will be a grey area. Since we're respecting work from w/e source, we prefer to stay out of the grey zones where possible. @ Tengu, no worries here on my end. The resources are free for both personal and commercial use. Also it should probably list things that are actually in there. There are sprites, portrait art, sound effects, etc. The bottom of the page also lists miscellaneous resources that might as well be listed by themselves in the thread anyways; not sure what to do about that. Do we know under what terms these assets may be used? About the list which Drake mentioned: not sure how to shape this. If anybody has an idea, please form it and post here. I'll update the OP then. Do you by any chance know if this one is ok to use too? That one is also fine. All that music is really interesting...but this is what interests me the most. I've been using Bfxr and FamiTracker to make sound effects, which by all means isn't a bad option, but I could never recreate the pichuun. Finally there is a good option. Good find! 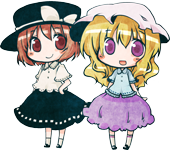 Are there free to use boss sprites for Suwako anywhere? I wouldn't be too surprised if there aren't but if there are I would like to know. Also, Alphes and Dairi's portraits say that commercial use is prohibited. Does that just mean that they can't be used in anything that is being sold or does it mean anything that is in a distributed file? I would think that it would mean the latter but if it does then it wouldn't make sense to link to them since we can't use them. In both cases of kaoru (not alphes) and dairi they are not for use in works being sold in general. Also do not rehost them. So, I was originally using a very high-quality Touhou-style bullet sheet but apparently the creator of the bullet sheet decided a few months ago that they didn't want anybody using their sprites, so I've got to find a new one. Macenight's sheet is pretty good, but I'm not quite satisfied with it. I was wondering though, does anybody know whether it's allowed to take sprites from other fangames? So, say I were to take the bullet sprites from Shining Shooting Star. Would those assets be not allowed for non-commercial use? I feel like that wouldn't be allowed but I also don't know of anything that would make that be the case, so I figured that I'd ask just to be sure. With these fangames where the contents are open, there is typically a readme describing permissions and/or a list of credits given to the respective artists (at which point you check the source). If there isn't one (as in the case with SSS as far as I know), by default you haven't received permission. You could try contacting the developers or something, but they are Chinese, so. Dream Magic - Duplex Spark! Does anyone know a place where I can pick up an Orin cat sound effect?